We Are Doomed is a twin-stick shooter that revolves around the idea that you ARE going to fail. I mean c’mon the game is called “We Are Doomed” so don’t think this is some easy-peezy game right here. It’s hard as heck but it’s fun and frustratingly addictive. So you’re basically this cute little white blob that has a sort of electric laser beam weapon that has a fairly short range. 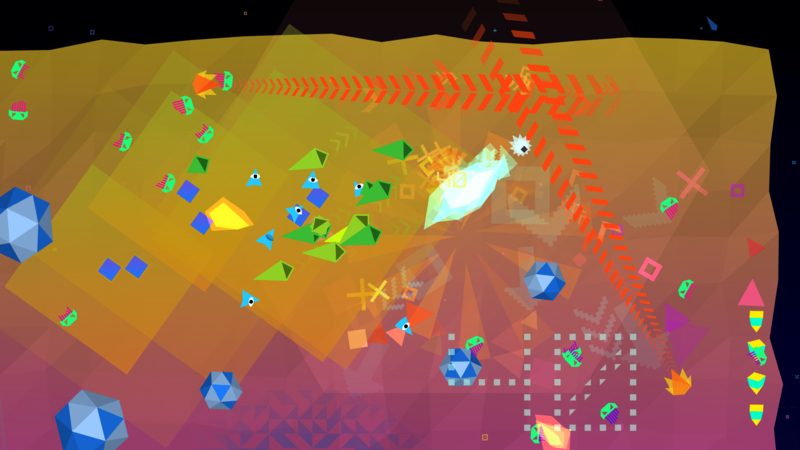 You control your laser beam with the right stick while traversing the single frame “arena” with the left stick, carefully avoiding the waves of enemies that spawn until you’re dead. Good news though, because it’s not an insta-death game. In Waves mode you can take 4 hits before you explode. 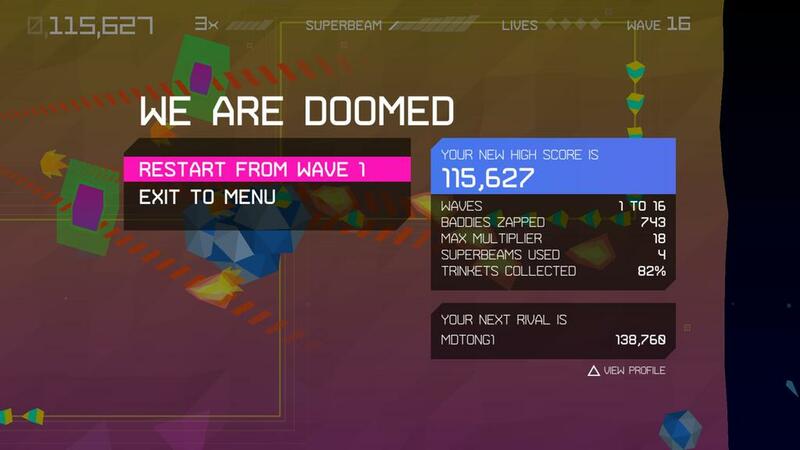 Waves mode is as it sounds, wave based and each wave increases slightly in difficulty. The difficulty scales in interesting ways, because sometimes a wave could have tons of the weaker enemies or a few more difficult enemies. The easier enemies sort of just float around and you can easily take them out, but when theres a ton of them on screen it makes navigating the screen tough because everything is so neon. Seriously. 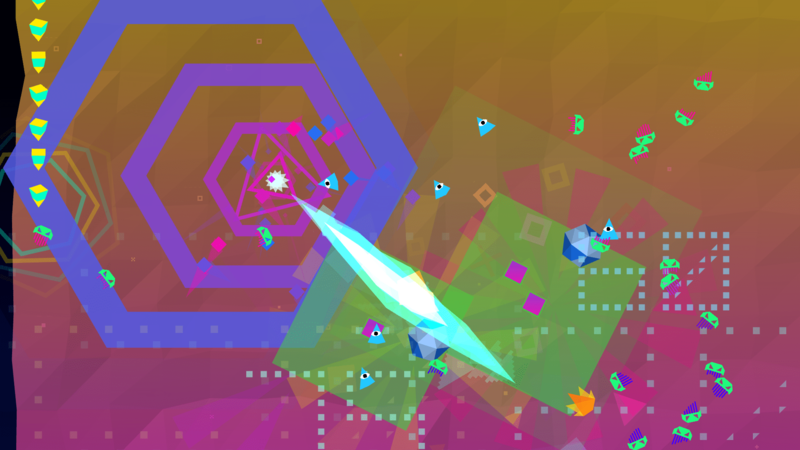 The game’s color palette is surprisingly enjoyable, though you wouldn’t think so at first glance because so many bright colors zipping around on screen might make your head spin (note: I’m not sure I would play this if you’re prone to epileptic events). The harder enemies not only take a second or two longer for your laser beam to destroy, they also actively seek you out on screen. There are also some enemies that can shoot things at you, which is always fun (read: it’s not really fun). Then theres also the occasional rock-like obstacles that float through the screen area as well, also adding to the “oh my god how am I supposed to dodge all this sh*t” factor. HAVE NO FEAR THOUGH! Because as you eliminate enemies, they drop little diamonds. Those little diamonds not only increase your score multiplier, they charge up your S U P E R B E A M!!!!!! What’s a superbeam you ask? Well it’s a super charged version of the standard laser beam you have, and it only lasts for a few seconds…but it pretty much eliminates anything it touches, including those pesky rocks that float across the screen. If you’re skilled enough, you can time the superbeam so that as you eliminate enemies on screen and collect the diamonds that occasionally drop, you can keep the super beam going even longer. Another plus? The superbeam DOUBLES whatever your current multiplier was so if you have a 10x multiplier going, it’ll be 20x for the duration of the superbeam. Pretty sweet. Just don’t get hit by an enemy though. Even though you’ve got 4 hits before you die (3 in Endless mode) you’ll lose multipliers every time you take a hit. Endless mode is just as it sounds, endless hoards of enemies with increasing difficulty. I’m not 100% on this but I feel like the multipliers add up faster in endless because it seems much easier to accumulate points while playing in endless, but theres no breaks as the enemies just keep spawning and spawning. So whats the deal with all the scores and multipliers? Well, the game has a leader-board that shows your next rival (aka next PSN friend or Steam friend) as well as global leader-boards. So every time you die you’ll be reminded of that friend of yours who happened to get a higher score than yours. It’s way more fun than you’d ever expect and it makes me want to keep playing to beat my friends’ scores. Overall opinion: If you enjoy twin-stick shooters with a slightly retro feel and a really neon/fluorescent color scheme then you’ll probably enjoy We Are Doomed. It’s available on PS4, Xbox One and Steam (PC/Mac) and at $9.99 on all platforms it’s worth it. There is a PSVita version in the works, but no current release date exists as the developer is a one-man team. Already have We Are Doomed? Leave a message in the comments letting us know what you think!